Budget Speech of Fiscal Year 2017/18 (2074/75) Government of Nepal Ministry of Finance 29 May 2017 (Jesth 15, 2074). Budget Speech of Fiscal Year 2017/18 Delivered to Legislature-Parliament by Honorable Deputy Prime Minister and Finance Minister Mr. Krishna Bahadur Mahara Monday 29 May 2017 (Jesth 15 2074), Government of Nepal Ministry of Finance 2017. 1. Nepal has been an independent and sovereign country for centuries. Though our present is complex and challenging, the past is glorious and our future is bright and full of possibilities. After the promulgation of the Constitution of the Democratic Republic of Nepal through different kinds of movements including Peoples’ Movement, Peoples’ War and Madhesh Movement in the different period of time, constitutionally people have been feeling the sense of changes. Now, we are in the phase of implementation of the Constitution by increasing its universal acceptance. Though this is a complex and challenging task, we do not have any alternatives to take it as a historic opportunity to move forward to build new Nepal. Despite getting wrangled into conflict from time to time, we have resolved big problems through consensus; collaboration and logical end. 2. I, in the capacity of Finance Minister of Nepal, the rise in this august parliament on 15 Jeth, the day on which this House declared Federal Democratic Republic Nepal, to present the budget of Fiscal Year 2017/18. On this glorious occasion, I pay my heartfelt tribute to those known and unknown martyrs who sacrificed their lives in different struggles including Peoples’ Movement, Peoples’ War and Madhesh Movement. Likewise, I would like to pay my respect to the injured and disappeared citizens. I salute all seniors who played leading role played in the Political and Social Transformation. 3. We have leaped forward historically in the political field. The country has headed towards political stability by ending perennial transition after promulgation and implementation of the Constitution. After the local level election, the environment has been created where each citizen can be engaged in local governance and development activities. The trust of the citizen towards the political system has been restored. Our roadmap is to fulfill peoples’ aspiration for rapid economic development by utilizing this time as an opportunity for socio-economic 2 transformations. To build the self-reliant and independent economy, Healthy and Competitive Economic System is our starting point, Socialism-oriented Economy is our destination. 4. Encouraging economic growth rate, achievement noticed in power sector in the short period of time, positive economic indicators, favorable investment environment, implementation of the Constitution and formation of local levels have indicated that the whole economic development of the country has positively been initiated. 5. After completion of the first phase of local level election, foundation for democratization, the peoples’ representatives have assumed their responsibilities. The process of the second phase election has begun. After the formation of the local level, it will not only implement the federalism and institutionalize the democracy but also ensure the direct participation of people in the development of their own locality. On this occasion, I express my heartfelt gratitude to those voters who participated in the first phase election and to all those who played a vital role in making the election a success, and also request for keeping the same spirit and support in the second phase election. 6. The annual budget, which functions as a leverage for economic development by providing policy guidance and facilitating through investment to bring effectiveness in economic, social and governance system to the country, is being presented in the house when the country is in a special situation. As per the Constitutional provision, it is mandatory to present the annual budget which is a means to the journey towards economic prosperity in the legislature-parliament on 15 Jeth. On the other hand, the process of formation of new Government has begun. The election code of conduct has become effective as the date for the second phase of election is approaching closer. Because of the election code of conduct, I am in such a situation which does not allow me to announce new programs and allocate the resources for them. 7. I have taken this difficult situation as an opportunity to make the local level resourceful since the local levels could select and implement their respective development programs and actions as guided by the Constitution. I am confident that it will establish the Nepali belief of “strong foundation makes the house stronger”. 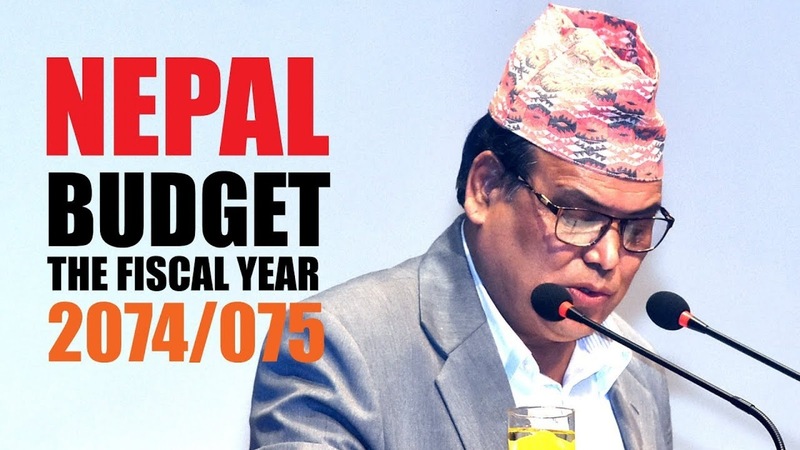 So, I have allocated the budget amount with the thought that “prosperous rural/urban is the base of prosperous Nepal”. Likewise, I have allocated the budget giving the priority to fiscal transfer to the Local Levels in the budget for Fiscal Year 2017/18, providing adequate resources for those ongoing programs and projects, accelerating the post-earthquake reconstruction and prioritizing two elections to be accomplished in coming fiscal year. 8. I have also allocated the budget with the objectives to upgrade Nepal to the Middle Income Country by 2030 by achieving Sustainable Development Goals and objectives set by the fourteenth Plan, to make economic growth sustainable by maintaining the current Fiscal Year’s growth rate and to complete the ongoing projects and programs speedily. 10. In the current Fiscal Year, the economic growth rate has been projected to be 6.9 percent, the highest in the past two and half decades. It is estimated that the growth rate of the agriculture sector will be 5.3 percent. It was mainly by increased production of summer and winter corps due to favorable monsoon and the efforts put by the Government for eased and accessible availability of factors of production. Because of improved labor 4 relation and eased power supply, the growth rate of the Industrial Sector will be 11 percent, which was negative in the last Fiscal Year. Likewise, service sector will grow by 6.9 percent. 11. The inflation rate has been declined to 3.5 percent in the first nine months of this Fiscal Year which remained high for a long time. It is estimated that the annual inflation rate will be lower than 6 percent in this Fiscal Year. It has eased the general consumers' livelihood and also supported to expand the economic activities as the production cost has been decreased. 12. The post-earthquake reconstruction, new construction and rehabilitation activities have started to speed up though it was a bit slow in the initial phase. The personal housing grant to the earthquake victims has already been increased to Rs. 300 thousand increasing additional grant Rs. 100 thousand. More than 95 percent of the earthquake victims of the 14 highly affected districts have received Rs. 50,000 as the first tranche of the grant. Similarly, more than 50,000 personal houses are in the phase of construction. The distribution of the first tranche of the grant in the remaining earthquake affected 17 districts has already been started. This grant has been managed to distribute through bank accounts. 13. The capital expenditure in the first ten months of this Fiscal Year has been notably increased, though public expenditure has not been increased as expected as compared to the same period of the previous years. Though there is a little sluggishness in the capital expenditure during last two months due to the local election, it is estimated that there will be 84 percent expenditure out of total capital expenditure by the end of this Fiscal Year. 14. Internal resource mobilization process is being improved sequentially. The total revenue collection by the end of this Fiscal Year will be Rs. 580.98 billion which is 103 percent of the revenue target. There has been a gradual improvement in the foreign aid mobilization. The development partners of Nepal 5 have already declared to increase in the annual contributory amount. 15. Internal Capital Market has improved. The NEPSE indicator, which is a measure of the capital market, has reached to 1615 point on May 28, 2017. In the Infrastructure summit and International Investment Conference, the Foreign Investors pledged to invest more than Rs. 1400 billion. Due to the improvement in liquidity in the Banks and Financial sectors, the loan flow to the private sector has increased by 15.6 percent in the first nine months of the current Fiscal Year though there was a little contraction in the initial months. It has been vital to expanding the economic activities through an increment in private investment.